•RivEX can generate a File GeoDatabase FeatureClass of regularly spaced points along the network. Spacing starts from the mouth of a catchment and builds points along the network at a user defined distance. •No points are created at the river mouth as this is the mouth node. •Points are created along the network separated by the user defined distance until RivEX reaches the headwater stream polylines. 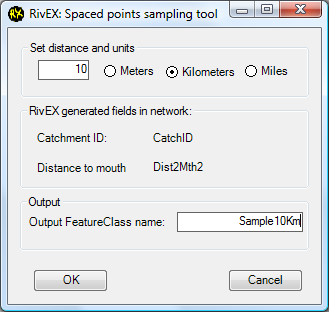 RivEX stops when it is unable to create a new upstream point at the user defined distance. In the image below the user has set the spacing distance to 1Km. The sections of river highlighted in green are less than 1Km from the source, thus RivEX stops generating points as 1Km upstream from the last point created would be off the network. •If your network contains loops or is a multi-threading channel then you will encounter the problem as described below. 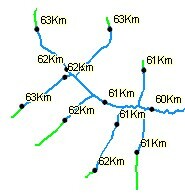 In the image, 500m spaced points were created along a network. Point 288 is 5Km from the river mouth, yet the next point upstream (280) is also 5Km from the river mouth! The loop in the network means that one side of the loop is shorter than the other. When RivEX was used to attribute polylines with distance to river mouth it traversed the side with point 279 first. It did this because this is the order of the rows in the dataset. •The only way to avoid the above situation is to simplify your network by reducing loops within your network to a single channel. Thus in the example above you will probably want to remove polyline 279 as this is an artificial channel (e.g. an old mill race) and polylines 287 and 288 constitute the original channel. •Your network must have be run through RivEX and processed for catchment ID and distance to mouth. Please refer to the appropriate sections of this manual for how to calculate these values. This tool will generate incorrect points if applied to data that is in a geographic coordinate system (i.e. latitude/longitude). For accurate results your network must be projected into a coordinate system which uses meter units. •To use this tool set the stepping distance and units that you want to sample the network, in the example below the user has chosen to sample the network every 10 km. •Enter a valid File GeoDatabase FeatureClass name, click OK to run the tool. Distance from mouth (which will be multiples of your entered stepping distance).